Octavo: 17 x 11 cm. (of 16), 236, , 237-238 (of 242) pp. A-P8, Q8, R4. This copy lacks leaf A1 (imprimatur,) leaf Q7, blank leaf Q8, and the final three leaves (R2-4) which comprise the final leaf of poems, the errata leaf, and the final blank. THE RARE UNAUTHORIZED FIRST EDITION. This was the only edition published in Philips’ lifetime. Philips’ died of smallpox in June 1664, five months after the appearance of this publication. The first authorized edition did not appear until 1667. Bound in contemporary sheepskin, re-cased. Fine internally. This is perhaps the most famous English collection of poems by a woman prior to 1700. P.W. Souers, in his critical biography of Katherine Philips, asserts for her the right to be historically the first English poetess—“In her, for the first time in the history of English letters, a woman was received into the select company of poets.” Jeremy Taylor dedicated to her his “Discourse on the Nature, Offices, and Measures of Friendship;” Abraham Cowley, Henry Vaughan the Silurist, Thomas Flatman, the Earl of Roscommon, and the Earl of Cork and Orrery all celebrated her talent, and Dryden could pay no higher compliment to Anne Killigrew than to compare her to Orinda. 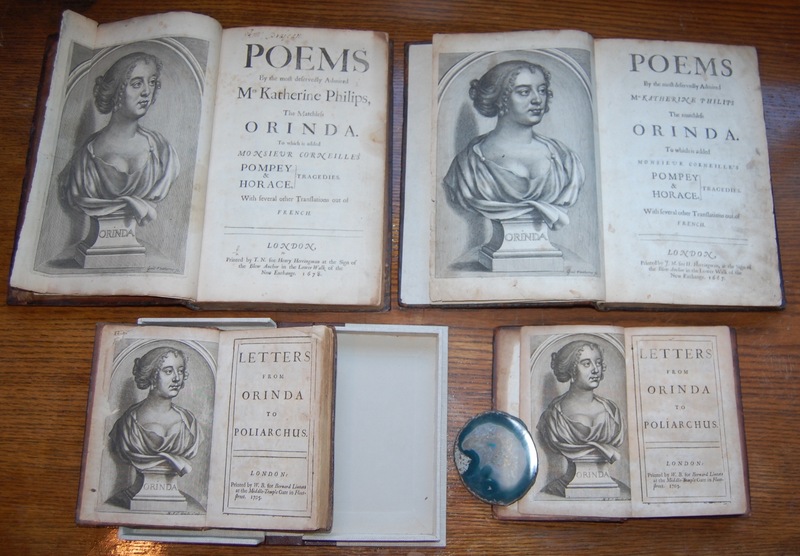 Poems By the most deservedly Admired Mrs. Katherine Philips The Matchless Orinda. To which is added Monsieur Corneille’s Pompey & Horace,} Tragedies. With several other Translations out of French. Folio 7 X 11 1/4 inches π2, A2, a-f2, B-Z2, Aa-Zz2, Aaa-Zzz2, Aaaa-Mmmm2. (Final leaf blank and original). 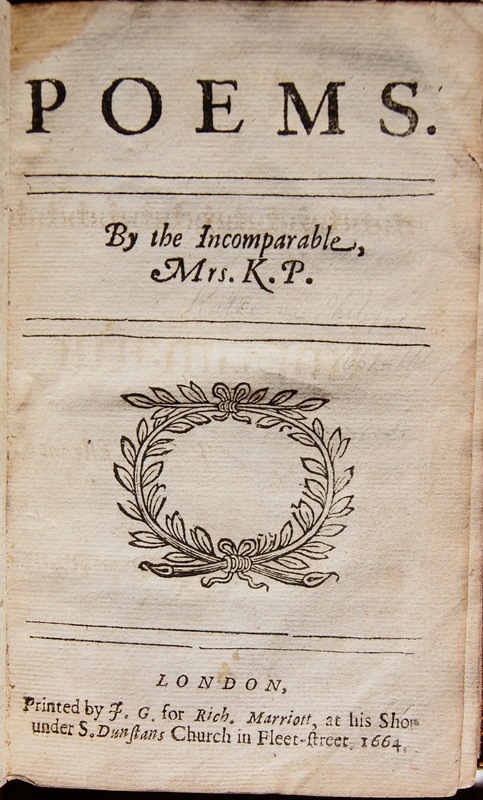 First sanctioned edition, enlarged, preceded by a pirated and suppressed edition of 1664 ( see Above). 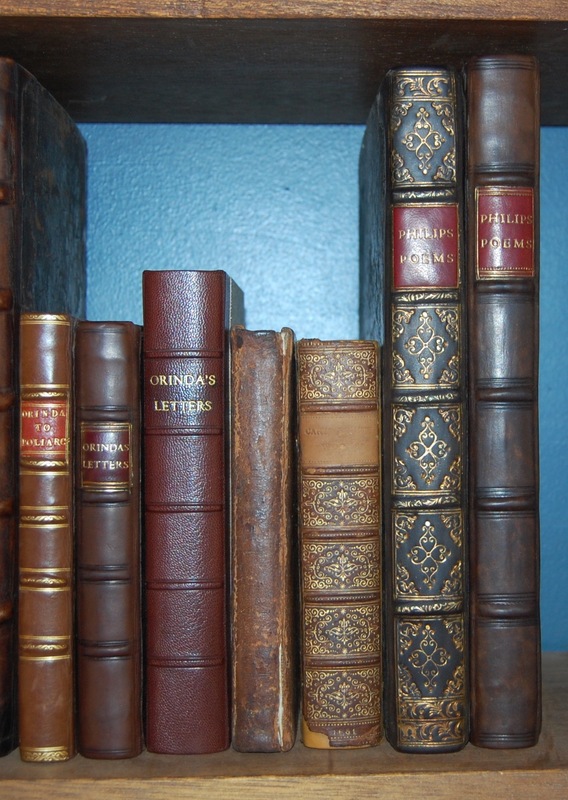 This copy is bound in contemporary boards, which have been recently rebacked with a gilt spine . 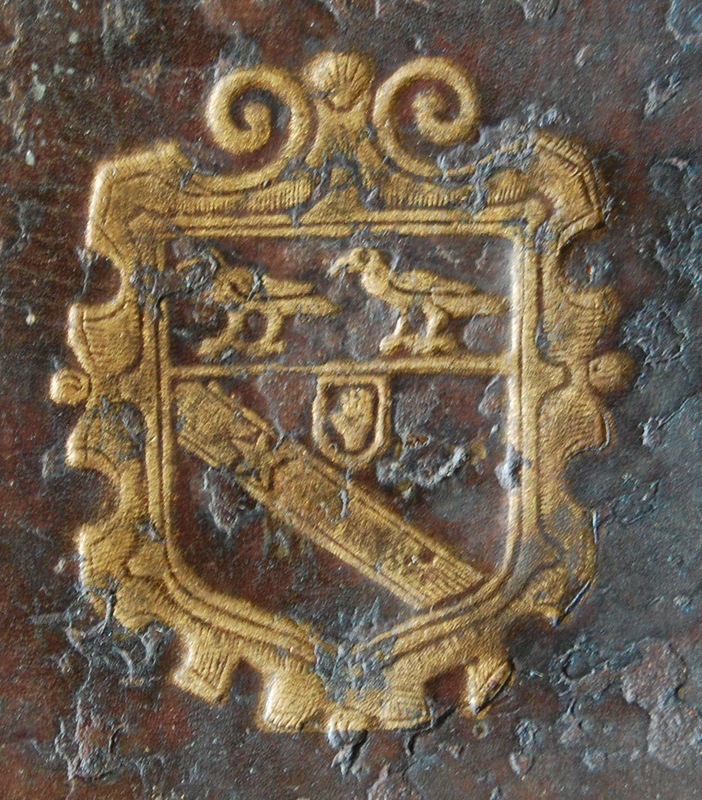 On the center of both boards are the arms of Sir Robert Vyner (1631-1688)Lord mayor of London. In 1674 Viner was elected lord mayor; the pageant on that occasion, which was witnessed by the king and queen, appears to have been more than usually magnificent. Elkanah Settle, the city poet, composed the verses, and the whole was produced at the cost of the Goldsmiths’ Company It is Interesting that he owned this book before he was Lord Mayor. Philips was “the daughter of a London merchant, Katherine Fowler [her maiden name] was probably the first English woman poet to have her work published. She married a gentleman of substance from Cardigan, James Philips, and seems to have moved effortlessly into the literary circle adorned by Vaughan, Cowley, and Jeremy Taylor. 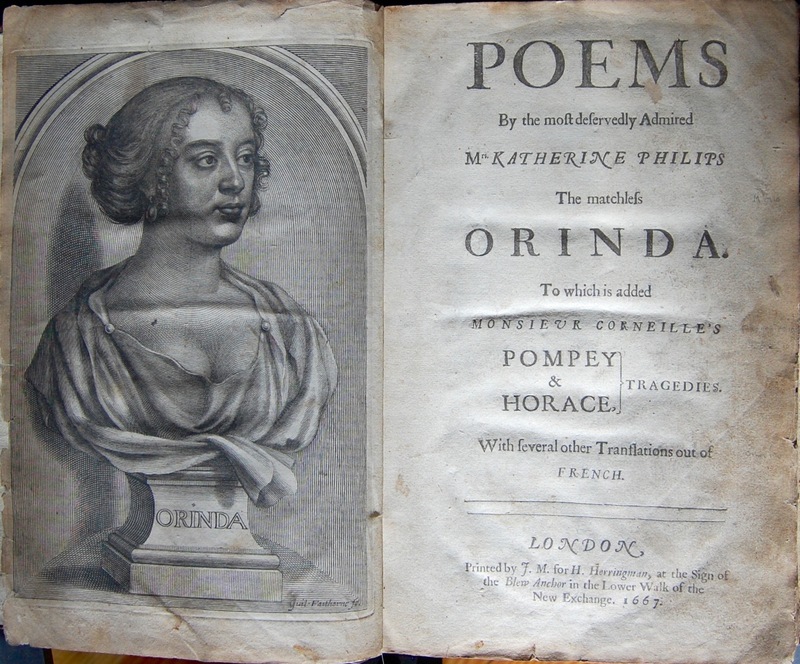 She was best known by her pseudonym ‘Orinda’ and the name appears on the collection of her Letters, which give a useful picture of the early seventeenth-century literary world. 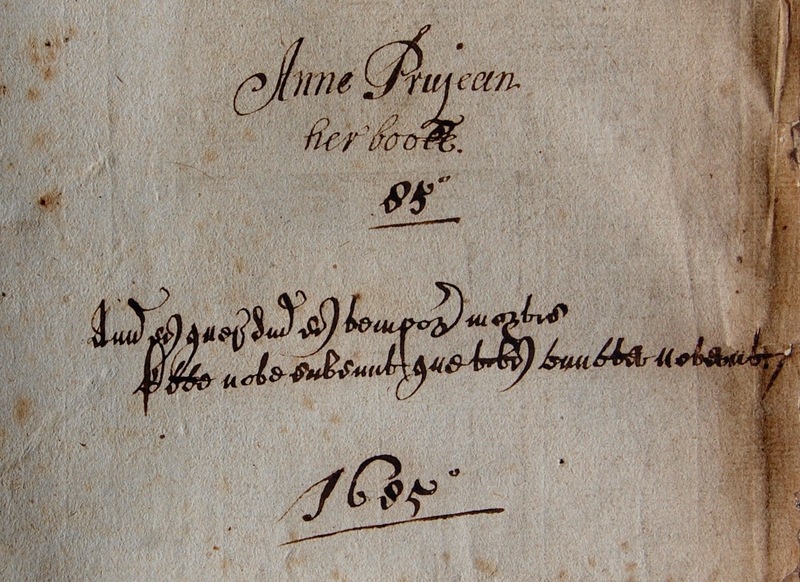 Her translation of Corneille’s ‘Pompee’ was performed in Dublin in 1663 and a collection of her verses was published posthumously in 1664.” (Stapleton)Mrs. Philips’ poems were circulated in manuscript, and secured for her a considerable reputation. The surreptitious quarto edition produced in 1664 caused her much annoyance, and …Some trouble was taken, it would appear, to destroy the copies, which would account for its rarity. In the preface of this 1667 edition, reference is made to the ‘false edition,’ and a long letter from the author in relation to it is quoted..
Wing P-2033; Hayward 116; Grolier 669; CBEL II, 480; Sweeney 3460. 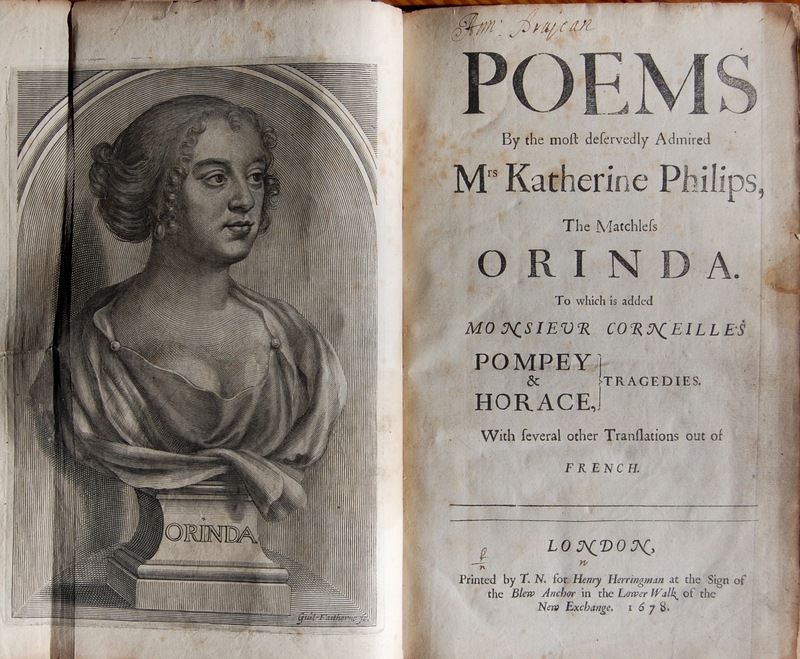 Poems By the most deservedly Admired Mrs. Katherine Philips, The Matchless Orinda. To which is added Monsieur Corneilles Pompey & Horace,} Tragedies. With several other Translations out of French. Folio 6 3/4 11 inches Fourth edition. [ ]2, A4, a-Z4, Aa-Tt4, Uu2. This copy also has ownership declarations and a book plate from the Prujean family. 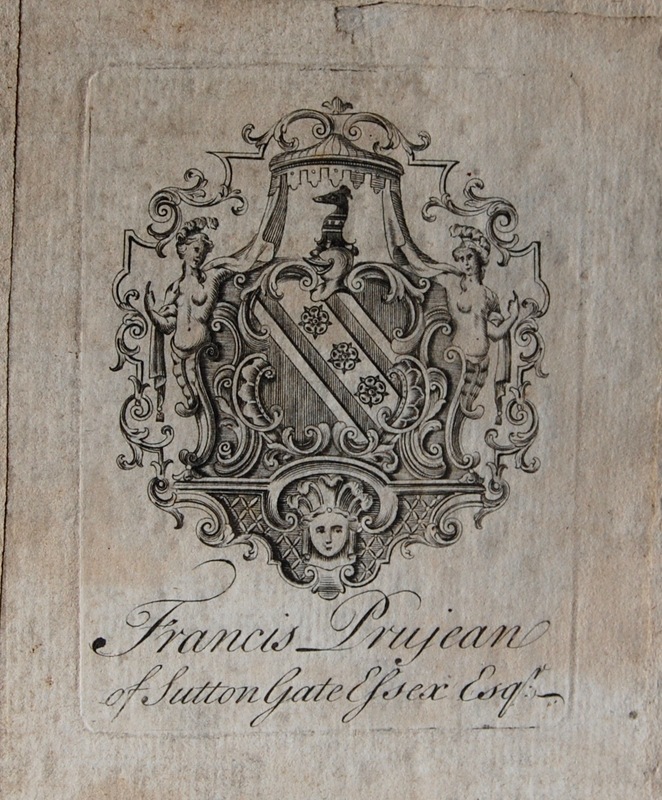 It was a gift from Mrs.Francis Prujean (Her book plate is here) to Ann Prujean 1682. Two Copies of Katherine Philips Letters. Octavo 6 3/4 X 3 3/4 inches A-R8 First edition. 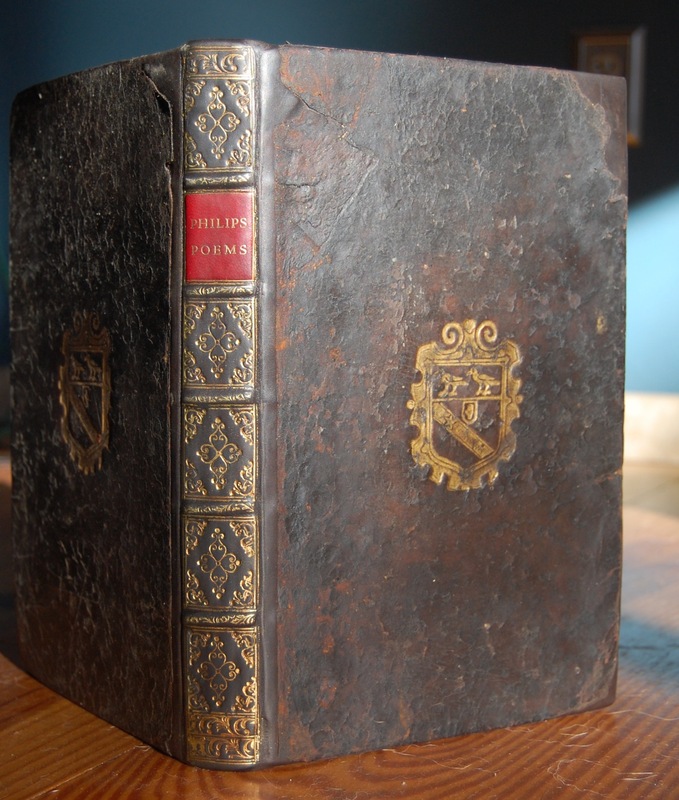 This copy is bound in original full calf stored in a custom morocco case. 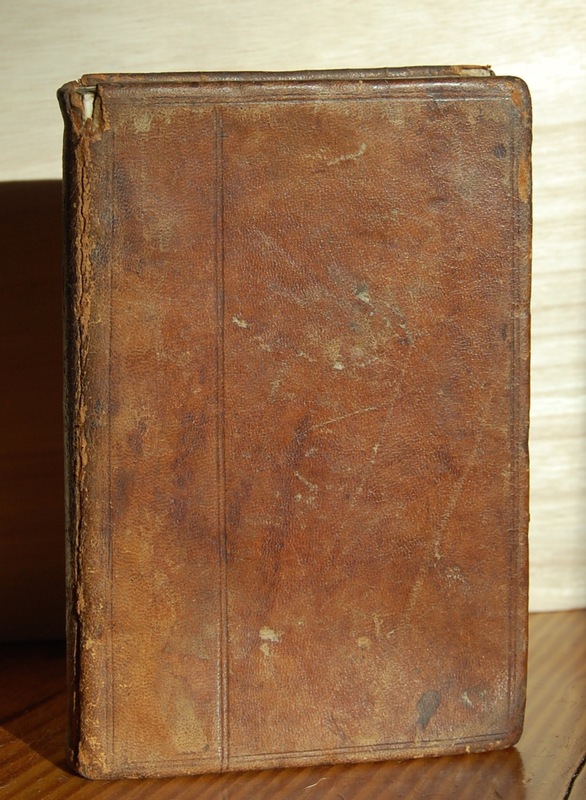 Another copy of the above, with a rebacked binding, same collation. 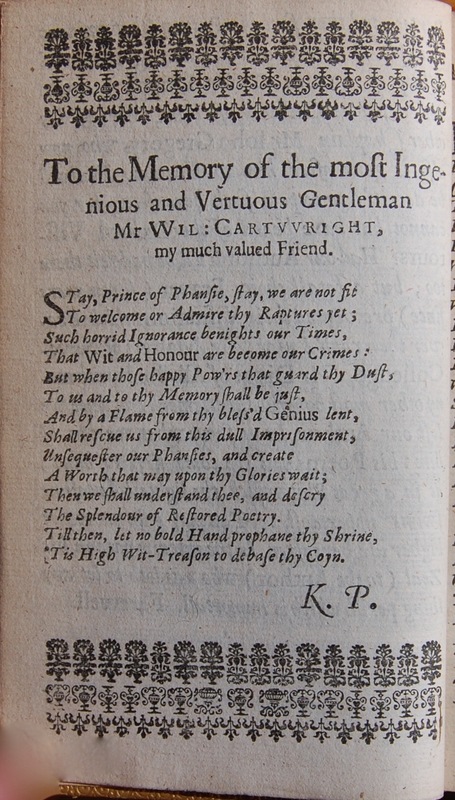 One of Philips’ early publications, a commendatory poem to the 1651 edition of Cartwright’s Poems. Octavo 4 1/4 X 6.1/2 inches. [Portrait]1, [a]-b8, *14 , *8, ¶4, **8, ***14, *10, a-e8, f4, g-k8, A-T8, U3, U8, X2, with leaf *11 in cancelled state as usual and showing the original stub. Leaves **7 and U1-3 appear to be in uncancelled state with no evidence of stubs, otherwise this collation matches that described by Evans. First edition. This copy is bound in modern butterscotch calf with a gilt spine, in period style.It is quite a nice copy. 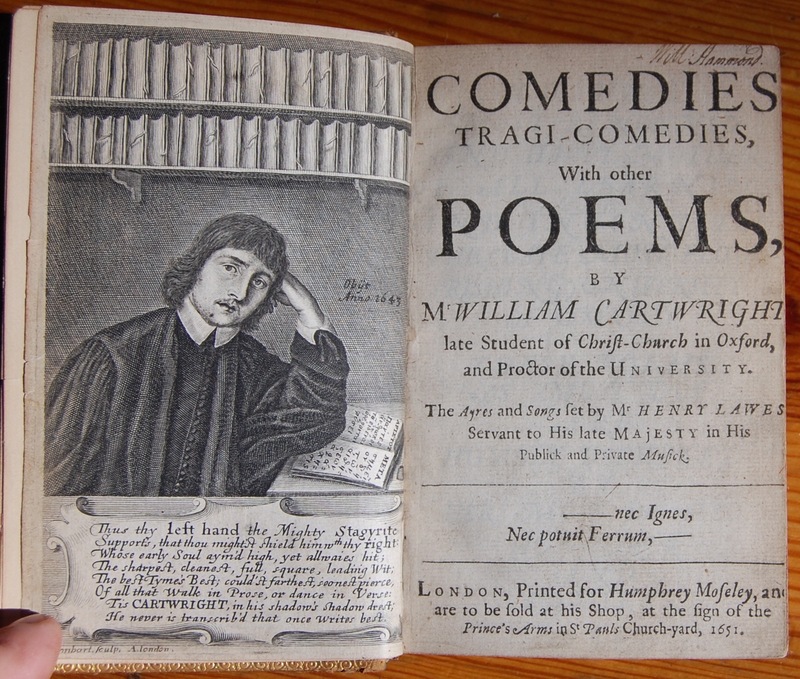 “Cartwright enjoyed a considerable success among his contemporaries but posterity has been less kind and his work is only known to students of seventeenth century literature. He was educated at Westminster School and went up to Christ Church, Oxford, in 1628; he spent the rest of his short life there. He wrote four plays, intended for academic performance: The Ordinary or The City Cozener (1634) shows clearly the influence of Ben Jonson; The Lady Errant, The Royall Slave, and The Siege or Love’s Convert were published in 1651. The Royall Slave, with designs by Inigo Jones and music by Henry Lawes, was acted for King Charles I and Henrietta Maria at Oxford in 1636 and proved a great success. Cartwright took holy orders in 1638 and wrote no more plays but he became a celebrated preacher; in 1642 he became reader in metaphysics to the university. A Royalist, Cartwright preached at Oxford before the king after the Battle of Edgehill. The edition of his works published in 1651 contained 51 commendatory verses by writers of the day, including Izaak Walton and Henry Vaughan. The Plays and Poems of William Cartwright were collected and edited by G. Blakemore Evans and published in 1951. (Stapleton) This work also includes the first poem by Katherine Phillips to be printed (DNB). Cartwright was well liked, and many of his wide circle of friends contributed to the verses occupying the first 100 pages or so; Dr. John Fell, Jasper Mayne, Henry Vaughan the Silurist, Alexander Brome, Izaak Walton, Francis Vaughan, Thomas Vaughan, Henry Lawes, Sir John Birkenhead, James Howell and many others. Wing C-709; see also The Plays and Poems of William Cartwright by G. Blakemore Evans, pages 62-72; Hayward English Poetry Catalogue, 104; Greg page 1027.